Either Kyoto or Tokyo, depending on what suits your itineray. Now when you fly in to Tokoyo, you can either fly to Narita Internationl airport (NRT) or Haneda International airport (HND). NRT is on the outskirts of the city it takes more than ahour to reach the city centre but there are plenty of flight options. HND is cloer to the city and takes about 30 minutes to get to the city centre. We were lucky to get good direct flight from SFO to HND. It is very conveniently located and connected very well by public transport to the city. We were going in July and expected the temperatures to be high, but not that high. 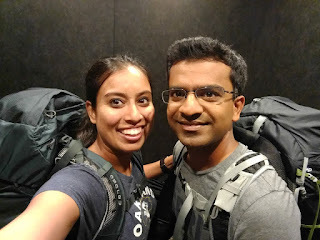 The humidity and heat was much like Delhi summers and it drained us. It wasn't the best season to visit Japan and I recommend you go either in early summer or early winters to avoid extreme weather. We arrived early in the morning at Haneda airport. We had to redeem our Japan Rail Pass coupons from one of the designated offices, but realised that the one at HND airport didn't open till 8 am. So, instead of waiting at the airport, we heade to our hotel in Tokyo, Tokyo Stay Ginza. The train ride itself got me excited! Yay!! Japan! Our hotel was newly renovated. The rooms were the smallest I have ever seen, but I am so mightly impressed as to how they had managed to fit in every damn thing in that space. You name it, you had it in the room. After we got ready, we headed straight to the Tokyo station to redeem our passes. It is a huge station and if you had fitbit on, you would have been happy to see the steps count that day. Also, for local trains in Tokyo there are two networks, the JR(Japan Rail) network was free to us but the stops were not conveniently located and the other network had many more stations, but we had to pay for the rides or we could get the daily pass from some locations. Stationery shops, BIC camera being one of them. So, we walked all the way (about a mile) to a shop only to discover that shop doesn't open until 10 am! Good Lord, I hope you are counting the number of steps with me. Anyhow, time to start our tourism. Yayy! First stop: Senso Ji Temple. Beautiful temple. Exactly how I imagined it to be. Very royal. I liked the market streets leading up to the temple. Perfect place to wander by. And I was excited to find out that the Japanese used essence sticks (agarbatti) for offering prayers, like we do. Alright, next up, Ueno park. The next staion. We walked up to the park. It was a huge one and we decided to only walk up to the lotus pond. We walked around a bit, the heat and humidity was killing us and we decided to not walk much, but to head out for lunch. Before we left, we saw a group of friends playing some music and performing in the park. That was nice and we got some rest. Here I talked to two really old Japanese men, sitting on the bench. They were trying to guess which country I was from and then decided to ask me to figure out who won. We happened to talk and they told me how they love Indians' warm and loving nature and their spicy food. Alright, hunger strikes, we are heading up to Priya, Indian restuarurant, close to our next stop of the day. After stuffing ourselves with some good Indian food and listening to Madhuri's songs on TV, we headed out to Shibuya. As soon as you step out of the station, you see the statue of Hachiko. And the crazy pedestriam crossing. Immediately, I realised the best place to get a shot would be the starbucks, second floor. But that was for later. First, we just wandered around here. You can easily get lost. It is like a shopping district located in the downtown. The most populous place I have been to, I guess, after Delhi. So many types of socks, so amazing. This place is like bustling with life. If you are still counting the steps, hang on, there is more to come. So, we finally went to starbucks for a cool drink in the darn hot weather and a good view of the crossing. I can't describe it, see the video. Next up, we headed to Harajuku, to see the Meji Shrine. 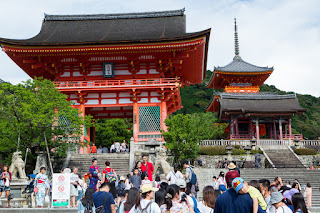 Just so you know, if you planning to go to Kyoto, you are gonna see much more amazing shrines there, you may skip this by all means. We then decided to skip the Yoyogi gardens and headed straight to Shinjuku. It is less posh version of Shibuya. 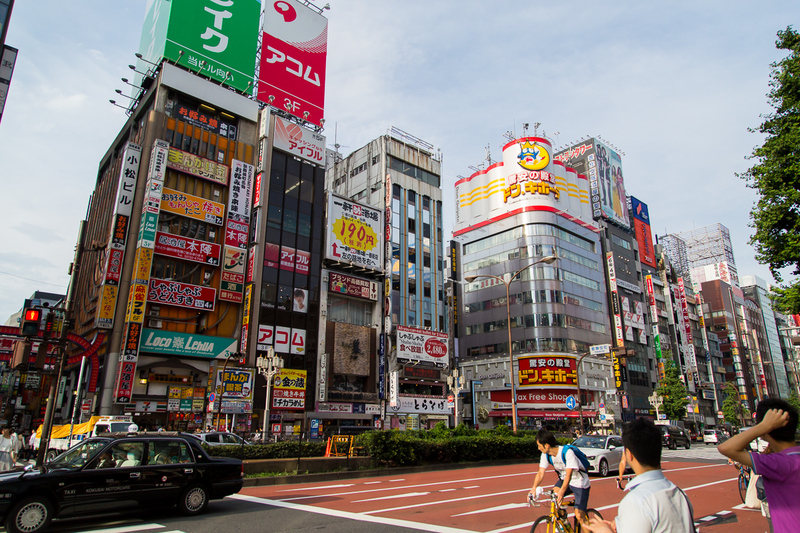 Looks the electronics shopping market area of Tokyo. There is a Robot restaurant where they have a robot show. It had good reviews on trip advisor, but we were in no modd to wait in the heat and headed to the mall to stay indoors and cool down a bit. After we recovered, we decided to call it a day and head back to our hotel. So, after a long walk back to our station (keep counting the steps) we took a train to our hotel. We relaxed for a while and found a public swimming pool close by. Well that was quite a bit of walk too, but the swim was super duper refreshing. Exactly what we needed. Now for dinner, we thought of going to Dhaba, again highly recommended by our friend who had lived in Tokyo for a while. So, we decided to walk (don't stop counting the steps yet). It was upposed to close at 10, but we made it in time at 9:30 only to discover that in Japan restaurants stop taking orders 30 minutes before the closing time. Arggghhh!!! But there was Bistro right across the street and we went there to find salad as the only vegetarian option on the menu. So, we went to the food court of a mall next door only to find there was not even a singly veggie dish on the menu of any of the restaurants. By now we were so cranky that we decided to setlle for that damn salad. To be fair, it was quite good. And yes before I forget, Ginza is the most posh area I have ever seen. Big brnads, with vibrance of Vegas and elegance of Paris, this is is where you want to spend your evenings. Then, we headed back to our hotel to call it a day. And if you were counting, the steps for the day were close to 30,000. Good morning Japan!I am already mighty impressed by your punctuality, hospitality and cleanliness. Lets see what we got today. 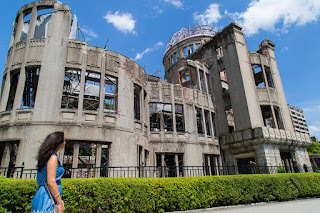 Given our schedule, we had to pick between a day trip to Mount Fuji or Hiroshima and for all the historical significance, we picked Hiroshima and we weren't planning on hiking Fuji anyway, so this made for a better choice. Early morning we were on our train to Hiroshima via Shin Osaka. When taking the Japan Rail, you can either get in to the coaches with pre assigned seating, or other coaches, where if crowded, you might not get a seat. So, we booked our seats for our trip to Hirsohima. It was a pretty empty coach and pretty clean too. The announcements were in Japanese and the only recognizable part of the sentence was the name of the city. The trains are on time. 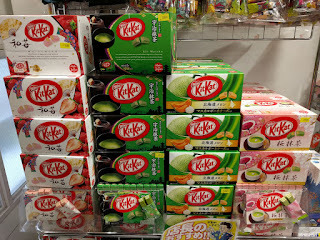 The little time we had during our stopover at Shin Osaka, we spent it hunting for veggie food. We only found cream sandwich that would fit our needs. 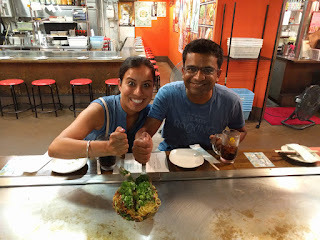 Well, after we reached Hiroshima, we dropped out luggage at Hotel Granvia Hiroshima, which was conveniently located right outside the station and headed straight to Indian restaurant Roopali. It was a short walk and the food was good. Then we got back to our hotel and our room was ready to check in. There is this city bus that runs around the city and stops at famous tourist stops. Since we had the JR pass, we were covered. Our first stop was the peace memorial. It is a huge park with the ground zero, the actual site of bomb detonation that was the most significant here. It was truly horrifying to see it. The museum was worth a visit too. After we walked around a bit and had mango flavored ice cream, we decided to go to Miyajima shrine. Getting here could be tricky, so here is the best route description I found. It was totally the highlight of the day. The shrine, the pagoda temple, the deer roaming freely around on the island. 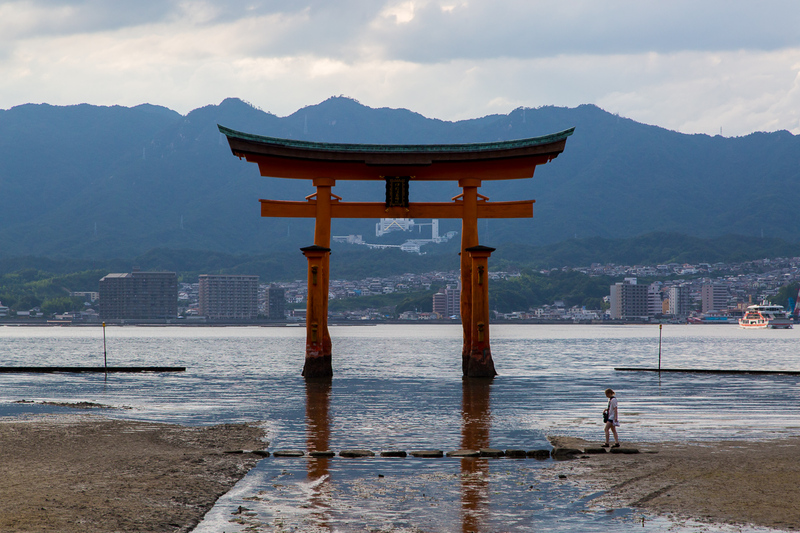 And not to forget the Torii gate. We could see the water rising at the base of the gate from low tide to high tide. The whole trip to the island the beautiful red corridors makes this a must-do in Hiroshima. There were quick heavy showers and that made the weather pleasant. restaurant that would serve us this traditional dish. Well, close to the train station, there was a Gaia building which had a food court on the top floor, so we just headed there. This food court specialized in Okonomiyaki, Well, there were these small shacks which has a grill for preparing them and stools arranged around the grill for you to see the preparation too. Super fun!! And Okonomiyaki was super tasty! After this, we headed to our hotel, we had an early morning train to Kyoto. We got on to our train to Kyoto. Impeccably clean trains and always on time. Once in Kyoto, we stepped out to walk to our hotel, Kyoto Tower hotel which was right outside the station and perfectly located. We checked in, freshened up and figured out the closest Indian restaurant. So, in Kyoto it felt that both bus and train are a good ways to commute. only issue being that the bus stops were written in Japanese inside the bus. So, we were constantly looking at google maps to figure out the bus number to board and using pattern matching to figure out the stop to get down at. Our lunch was at Ajanta, not a great Indian restaurant I'd say. There are better options for Indian food in Kyoto. 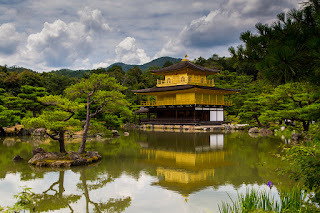 After we were refueled, we headed to Ginkaku-ji or Silver Pavilion. A cute little market leading up to it. The place itself didn't take long to walk around. 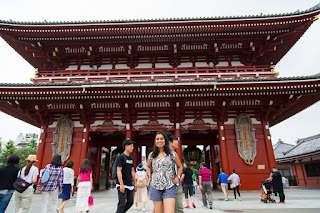 Our plan was to walk down the "Philosopher's Walk" and visit all the shrines and temples along the path. It was a pretty little shaded walk with trees around. So, shade was a welcome relief in that weather. 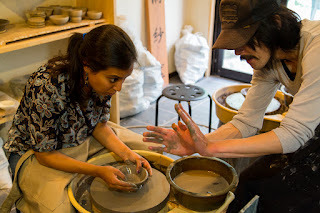 On our walk, I spotted a pottery shop, with pottery lessons! 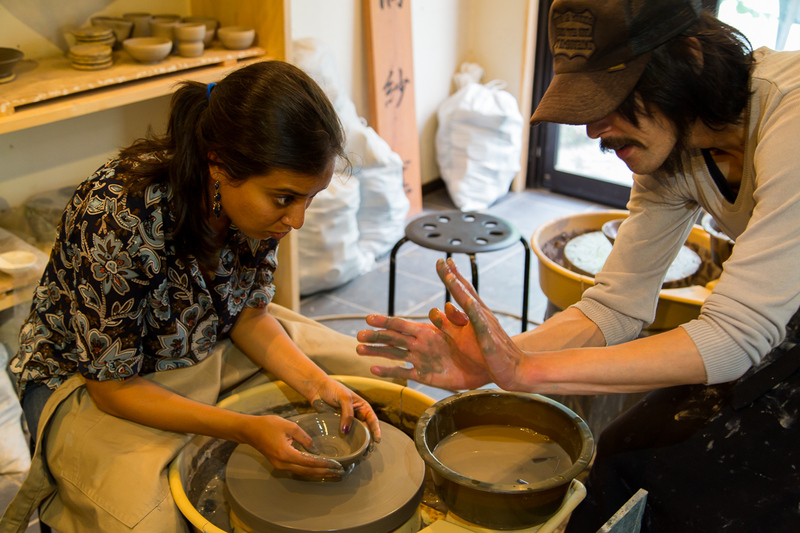 I walked in to see some tourists making pottery and I learnt that they would ship my bowl/cup back to states in a few weeks. I didn't think twice before grabbing a chair. Oh, it was fun and I was so excited when I received my rice bowl back at home a few weeks later. Perfect souvenir. As we continued down the walk, we visited Nanzen-ji and Chion-in. By now, we were extremely tired of all the walking. So, we took a cab to Kiyamizu-dera Temple. It was full of tourists and bustling with activity. There were so many little shops to get to the temple. Men and women both dressed in traditional attire were headed to the temple. Loved this place for its hustle-bustle. Next up, we took a bus to Sanju-sangen-do, only to discover that it had closed like 2 minutes ago. 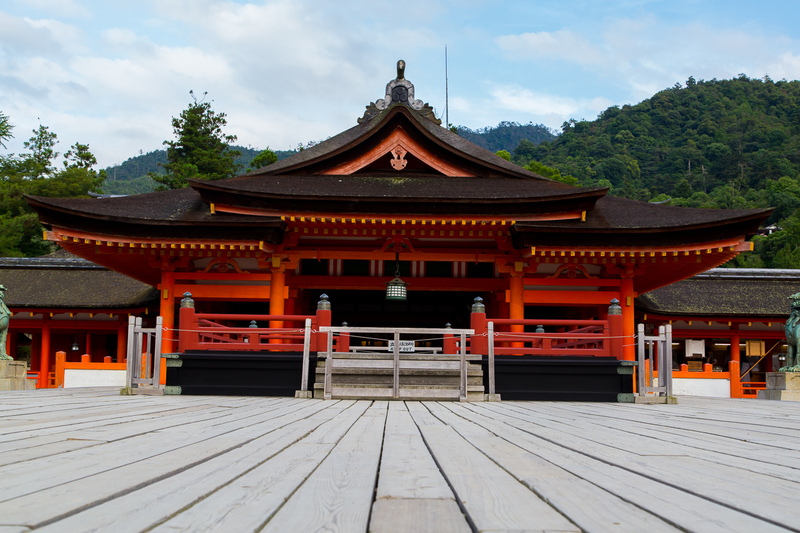 Nevermind, we decided to take the train to Fujima Inari shrine. We missed the station and didn't realise till about twenty minutes and felt we were on the outskirts of the city. Oh boy! time to get off and take the train in the reverse direction. Well, when we got to the correct station, the shrine was right outside the train station. 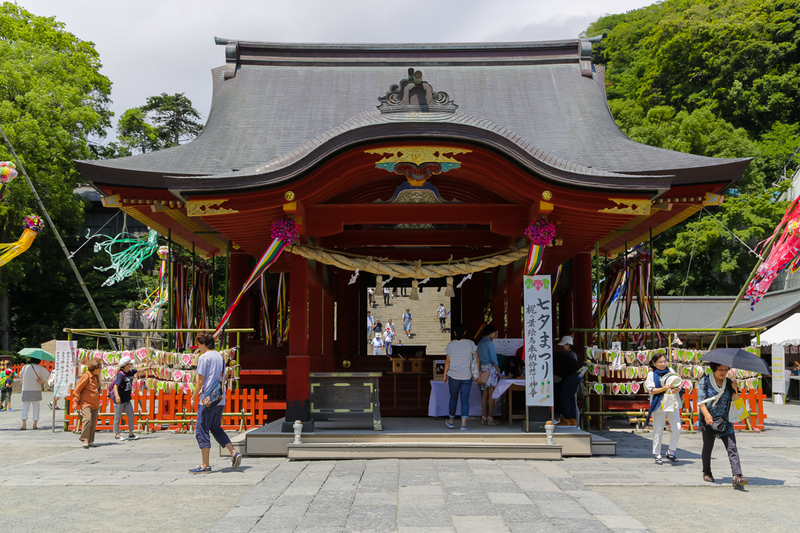 This shrine has a whole hike through the torri gates. Absolutely beautiful. This was my favorite place in Kyoto. Sumit was a bit tired so I walked around the hiking path for a while and then we both decided to head home. But before that, it was time to grab some dinner and we decided to go to Mughal. This day was once again full of walking around the city. So, before you visit Japan, make sure you got your pedometer with you. Day two in Kyoto. Today we were going to the temples and shrines on the outskirts. And we had figured out the previous day that buses would work better as the train stops were a little farther away. So, after gradding a quick coffeee and croissant from the neaby Starbucks, it was time for us to head to Tenryu-ji. It was so hot and humid that after walking around for 5-10 minutes, we just wanted to rest in the shade. 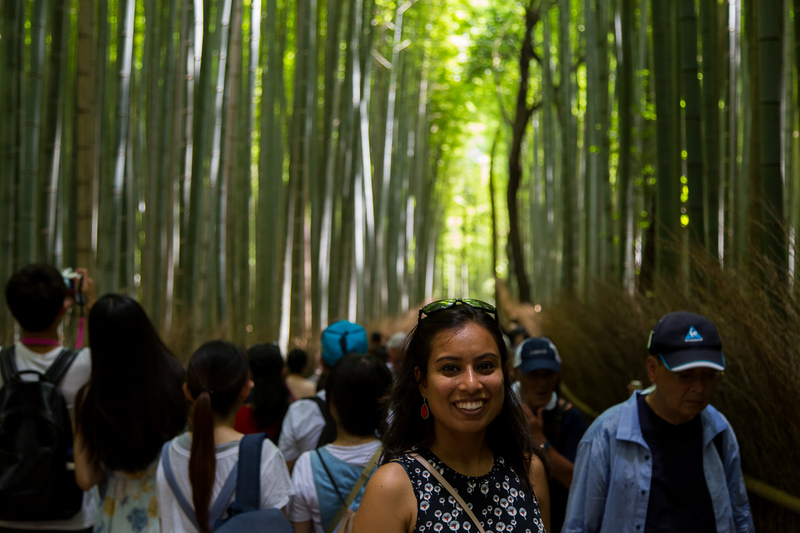 Right outside Tenryu-ji was the bamboo garden. It is really pretty, but unlike the pictures you see online, it is super crowded, so you can't get that prefect shot. 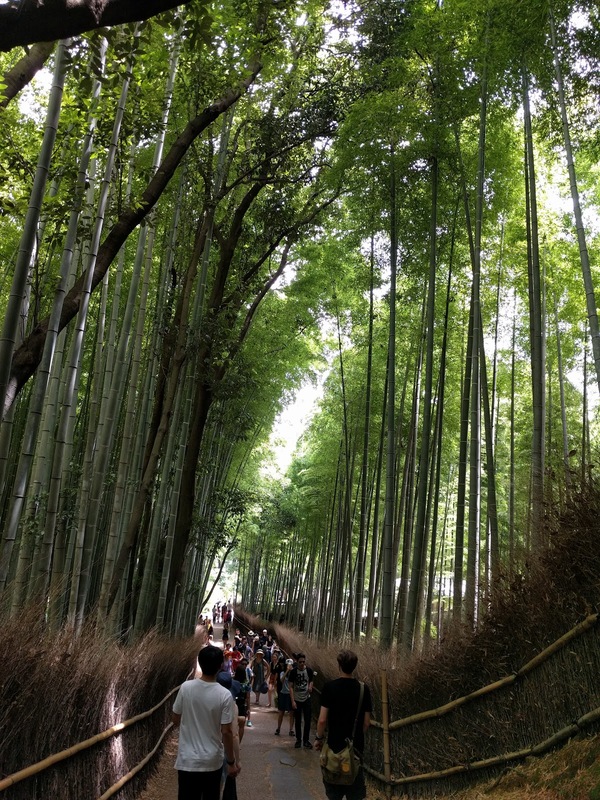 There is one long walkway that is lined with bamboos on both sides. 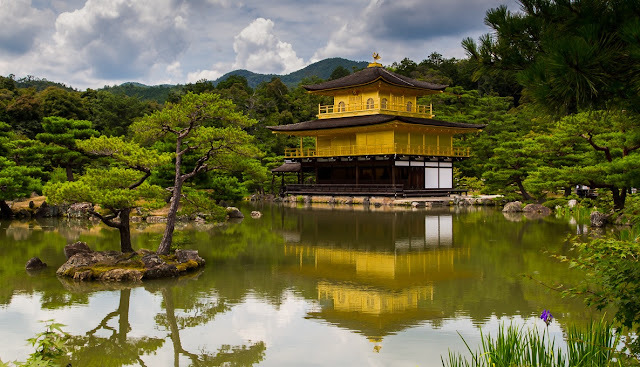 The garden as such is on a huge area and you could walk around, but decided to skip it and headed to our next destination, Kinkaku-ji or the Golden Pavilion. Now, this was one of the prettiest temples I had seen. A perfect golden temple with a perfect reflection to complement it. This would be a must see. Next up, we decided to head to Nijo castle only to find out it was closed on that day of the week. Ugh, so much effort in so much heat for what! So, we started looking for food sources and found this place Tadka for lunch. Sanjusangen-do temple with a 1000 warrior statues which we had missed the previous day. It wasn't surprising to see so many similarities in both buddist and hindu mythology. It didn't take long for us to go around, but pictures were prohibited. A small restaurant inside a home. But this was the most authentic south indian food I had in Japan. So good, you would lick your fingers. I was so impressed that I asked if the chef was Indian. But it turned out the chef had actually trained in India for a year or so. You got to have food here if you are in Kyoto. Well, now that we were refueled, we headed out to our next stop, Sanjusongen-do. This was our last stop for the day before we headed to our hotels to pack up and head out to Kyoto station to board our trains to Tokyo. 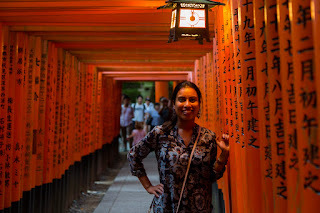 Kyoto had so much to see that you really can't do justice to this place in two days. Until, next time! When we got to Tokyo, we decided to visit the Tokyo Tower at night after dinner. This time we made it to Dhaba restuarant well in time. The food was really good. I didn't expect Indian restaurants in Japan to be so good. It was a pleasant surprise. We had dosas. And before I forget to take a note, we saw a drunkard the the train station. Like, really a Johnly Walker kind of drunkard. From here, we took a bus to Tokyo tower. Once we got our tickets, we headed to the observation deck. I am glad we did at night time because the views were just so beautiful. We spent some time strolling about on the two levels of the observation decks. Then we got down and Uber'd to our hotel. Sumit had declared the previous night that he was too tired to walk the next day and wanted to take it easy. 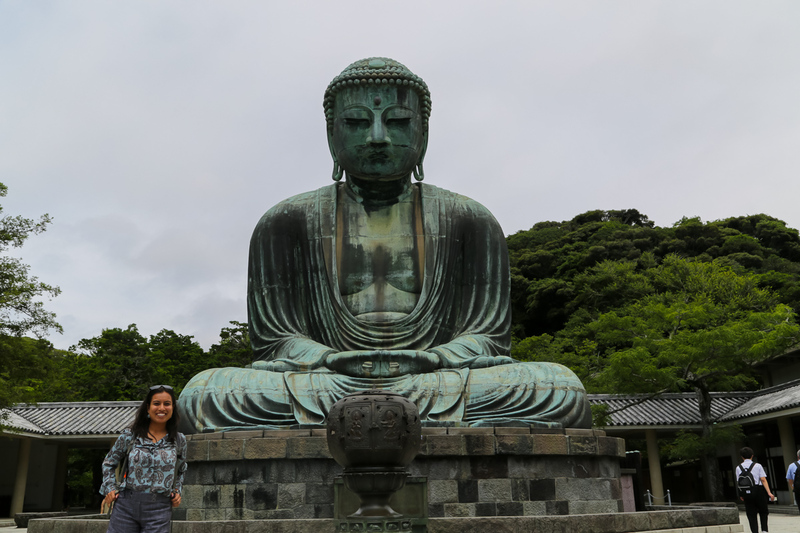 So, I decided to take a solo day-trip to Kamakura. I got on the train for Kamakura. Once you get down at the station, everything is pretty well marked. You can get tickets for the local train at the ticket booth where they also have brochures for all the touristy stops. It was an easy walk to the giant Buddha statue(Kotoku-in) from the local train station. It wasn't just the statue, but whole set up that made you feel at peace. It was a very pleasant day which added to the experience after having spent 4 days in scorching sun. You could walk inside this hollow statue too. Once, I was done roaming around and taking pictures, I headed to the Hase-dera temple. Pretty fancy temple will gold plated statues and a beautiful view from the courtyard overlooking the beach. It was cloudy, but I hear that you get a pretty clear view of Mount Fuji from here as well. I went to the beach for a short walk but wasn't very impressed and decided to get back to the Kamakura station. 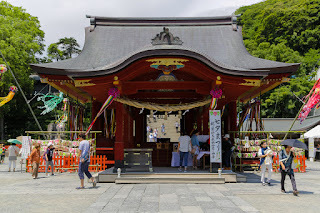 There was a shrine very close by and it the walk was through wiggly streets flocked with shops on either sides. Pretty good day to walk around in general. Once here, I was happy to see the lanterns floating around and the flock of tourists. After spending a few minutes, I headed back to Tokyo. Sumit and I decided to have conveyer-belt sushi in Shibuya. Our meeting point- Hachiko. Then we walked around a bit, shopped around somewhat since we had the entire day to just do nothing. After we were done with Shibuya, we headed to Roppongi Hills. This is another posh area after Ginza, but is mostly for corporate offices. We went to Roppongi Tower to visit Google's Japan office since Sumit was carrying his badge. Pretty cool, eh? After grabbing some snacks, and walking around the area, we decided to have dinner at Green Asia. Average food, but a very posh area to hang out. Then we headed straight to our hotels, to check out and were on our way to the Haneda airport for our flight back home. Arigato Japan! I am amazed at how traditional yet modern you are. How overly crowded, yet developed you are. How focused and friendly you are. I will be back for more. 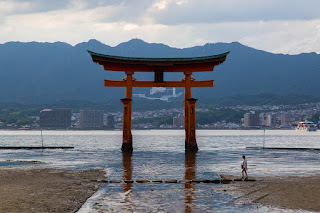 Pilgrimage hike: Next time we are in Japan, we plan to take this pilgrimage hike. This time we were just not up to it. 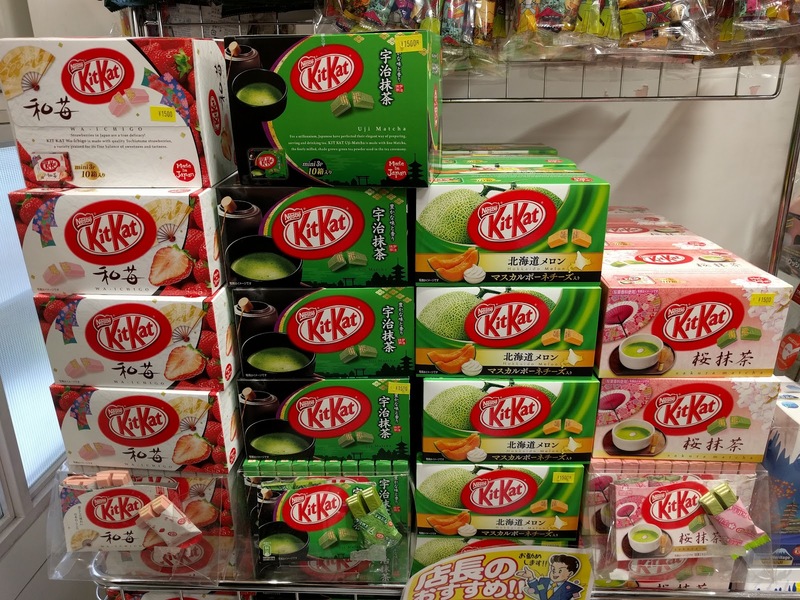 Don't forget to purchase the different flavors of kitkat here in Japan. Nara: A day trip from Kyoto. Has more temples to visit. Fuji: We wanted to visit Mount Fuji initially but figured that hiking at night to see the sunrise is the bext way to explore this option, but it seemed that it might still be covered in snow during first week of July so decided to give it a pass. See this.